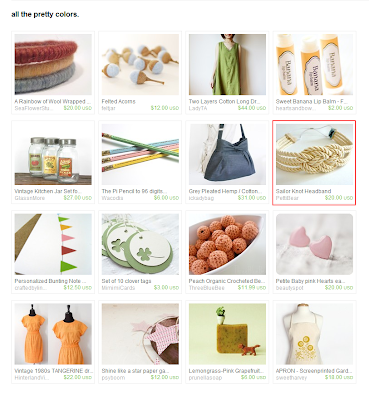 Noella Beauty Works created a beautiful and soft etsy treasury named "all the pretty colors"
featured with my Sailor Knot Headband...and my theory about our shop reflecting the choices we make while creating treasuries has proven me right again!!! Noella Beauty Works is your one-stop shop for PURE, NATURAL Mineral Makeup. Offered in NBW is an extensive line of mineral eyeshadows, foundations, concealers and blush at affordable prices. "My name is Jaclyn and I'm the owner of Noella Beauty Works". "I'm 21 and a full time student, a part time Barista at a local coffee shop and a full time etsian...I'm a busy bee! But I enjoy every second of it". "My goal here is to provide a quality product, at an affordable price and above all offer excellent customer service". Become a FB fan and get instant access to GIVEAWAYS, specials, discounts, sneak peeks and more! Wow... lady, you are young !!! I sure you stand before a great and pretty future , all painted in PRETTY COLORS!!!! Good Luck with your FANTASTIC line,I sure will try your products-they all look fabulous!